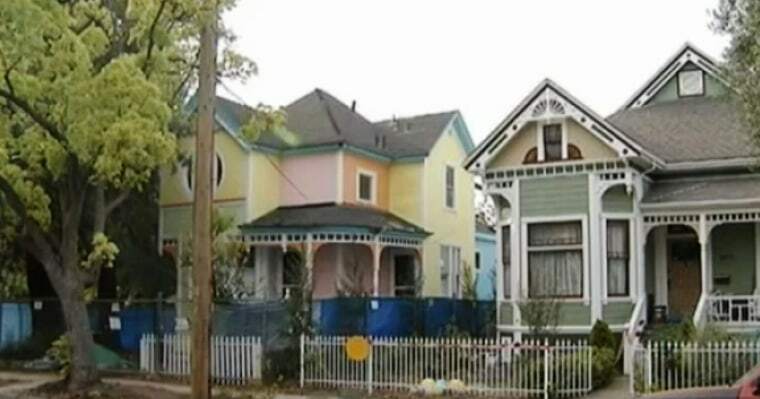 The couple whose Victorian house has drawn neighbors' ire for its whimsical Disney-style paint job are now being sued by a neighbor who claims their remodeling dumped toxic lead into her yard. Sarah Doty filed the lawsuit after a judge denied an injunction to stop the remodel. The attorney representing the homeowners denied all allegations against his clients. The couple who owns the house, Hosam Haggog and Fatima Rahman, said they chose the color scheme for the house in Santa Clara’s Quad neighborhood because their daughters love the animated movie “Up." Neighbors attempted to stop the remodel of the home with hopes of keeping the Victorian in its original "historic" look. The neighborhood association board member said the problem is the new paint masks an "ugly truth." “It’s not the color, it’s absolutely not the color, it’s about making sure that people follow safe procedures when they remodel their houses,” said Sudhanshu Jain of the Old Quad Residents Association. The neighborhood association also questions the city’s permit process and code enforcement. Several neighbors are suing the city over it. While the neighborhood is divided on the paint and the historical correctness – and even the lead concern – many of the neighbors said they are ready to move on. “He just wants to live in his house, just let him live in his house,” Diana Mendoza said.